There are three minutes left in the final game of the season, after which the numbers "2-14" will be etched into the Raiders history book. Try as I might, and despite all of the evidence, I still have a hard time understanding the supernatural ineptitude of our offense. If I recall correctly, we've scored one touchdown over the past 16 quarters. Aaron Brooks isn't the worst quarterback ever. Guys like Ronald Curry and Doug Gabriel are quite capable (as is Randy Moss). Justin Fargas and Zack Crockett aren't pathetic. And our offensive line, while still a big problem, has stiffened a bit, and can't be blamed for everything. Yet here we are, a living definition of utter offensive impotence. Consider that the Texans had a similarly awful offensive line last year, a season in which they also went 2-14, but they managed to put up scoring totals of 27, 15, 30 and 20 over their last four games. So this goes deeper than our line. How deep? Pretty deep, but I can't say for sure. All I know is that something is seriously wrong. It doesn't make sense, it still defies explanation, and I'm just glad it's over. Now it's time for big changes on the offensive side of the ball. So Santa Claus came and went, leaving neither a victory for the Raiders over the Chiefs nor what you really wanted under your Christmas tree. 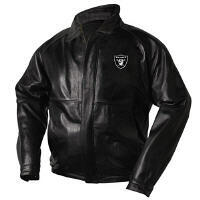 Don’t despair—just return the misbegotten gifts and apply your earnings toward the Oakland Raiders Leather Jacket at Sam’s Club Online. While NFL.com offers a similar (if not the same, could be) jacket for $250, you can get this one for just $139.00. You do need a Sam’s Club membership to make a purchase at SamsClub.com. I particularly like this jacket’s simple classic design. It’s lean and mean and stylish, the kind of apparel you will want to wear during the inevitable Return to Glory. Click here to check it out. What can I say? This offense couldn't score a touchdown against my two dead cats. This team needs a serious intervention. It's a tough job, but I'm sure we're up to the task. In the coming weeks (thanks to Damon for the suggestion! ), we will break down the offense and discuss what should be done. The QB discussion has already started below, but we'll give it more formal treatment along with the other positions. It gives me something to look forward to, a rarity these days. P.S. I'm on the road, staying with family, saddled with a creaky dial-up connection. I appreciate everying keeping the commentary fires burning while my take-nology is temporarily disabled due to holiday traveling. I wish everyone a very Merry Christmas! And I hope that Santa Claus leaves a very good strategic plan under the Christmas tree in Alameda. On the past few seasons of the reality show Survivor, they have implemented a new twist called Exile Island, in which a contestant is banished to a barren little island for a night. If the Oakland Raiders were playing Survivor (hey, wait, maybe they are! ), then I think Exile Island might be populated by a guy named Aaron Brooks. I don’t mean that the team has intentionally exiled Aaron Brooks, but rather that circumstances have conspired to isolate him, adding yet another layer of drama and uncertainty to our offense as we close out the season and look forward to next year. Here’s what I wrote on December 4, after the Texans game: Aaron Brooks was really pissed off about something late in the second quarter. He gestured repeatedly toward the sideline after plays, raising his arms in apparent bewilderment or anger. What was up with that? Was he angry with the playcalling, or upset with his teammates? When the drive failed, he roamed the sideline alone. I am convinced that we have serious relationship issues on our offense. I see very little communication or togetherness on the sideline. I see a unit divided. It explains what we’re seeing on the field, which is an absence of timing and chemistry, along with inexcusable confusion and lack of execution unrelated to talent. Now, here’s a report from the San Francisco Chronicle, filed this week: Signed in the off-season to a two-year contract, Brooks doesn't know whether the Raiders will pick up his $5 million option for next year. From the sounds of it, Brooks will be just fine walking away…"What's really going on?" Brooks said. "You see issues across the board, as far as offensively is concerned, that make you think like, 'What the f--- have I got into?' It's been tough, man. A lot of time I've been biting that fist of mine. F--- it, I gotta do it, good or bad. "…He saved the nasty stuff for wide receivers Jerry Porter and Randy Moss, saying he's talked to them about their complaining ways to no use. He gave a brutally honest assessment of the offensive line's protection problems and the three-step pocket that collapses quicker than he can release the ball. I guess I was right. When your quarterback has no respect for, or chemistry with, your top two receivers, then you’re in trouble. When, on top of that, your pocket frequently collapses around this quarterback faster than it takes John Madden to say, “Boom!” then you’re really in trouble. And, when the quarterback in question is prone to ill-timed mistakes, then you’ve got a perfect storm of trouble. Welcome to your 2006 Raiders offense. It’s clear that Aaron Brooks never gelled, personally or professionally, with Randy Moss or Jerry Porter. A brutal opening game, followed by an injury, further disrupted Brooks’ integration into the offensive fabric. Upon his return, he brought an immediate spark to our offense, and continued to maintain an upbeat attitude, at least in the press (until Monday, of course), but the spark has since been snuffed. Now it looks like Brooks' tenure as our starting quarterback might end just as it began: ugly. Is Brooks part of the offensive problem, or a victim of it? At this point, it’s really hard to say. I think he’s a good man. I think he has legitimate gripes about Moss, Porter and the offensive line. I think he can be effective under the right circumstances. But I doubt that he is going to find these circumstances in Oakland, even if Moss and Porter hit the road. In other words, Aaron Brooks may have a future, but he isn’t our future. But if he isn’t our future at quarterback, who is? It's a question we'll have to ask very soon. P.S. This take is dedicated to Tim Mo, who gave me a little hell about having a take. If you haven't seen it yet, check out this clip of Mr. Davis speaking to the media on Sunday. I love it. Rumors of his decriptude have obviously been greatly exaggerated. This guy is still a badass. I know that some folks will view this as another opportunity to come in here and blame Mr. Davis for all the ails the Raiders right now. Not me. I still dig Mr. Davis. I would not understimate him, either. He is fully aware of the circumstances, and what's at stake. I would love nothing more than to see him enjoy a Return to Glory over the next few years. There's a lot of work to be done, but I wouldn't be surprised if he's up to the task. In fact, I expect it, because I know he expects it. P.S. Check out this article for a refreshingly positive take on Mr. Davis (thanks to Roberto from Raider Raza for the link). What more can I say about a Raiders offense that fails to score a single point at home against an opponent that has lost seven of its previous eight games? Against an opponent that, until today, was ranked 30th in the league in points allowed (25.3 average per game). How did the Raiders manage to lay a goose egg against these guys? It's quite an accomplishment, as well as a new low. I'd love to sugarcoat the situation. But I'm all out of sugar, folks. Help me out. What's your take? Doug Gabriel: Story or Non-Story? As far back as late May, I thought Doug Gabriel would be our number two wide receiver for the start of the regular season. Ronald Curry’s recovery was a work in progress, and Jerry Porter was starting to flap his gums about Art Shell. We all know what happened next: Porter flapped his gums all the way to the doghouse, Gabriel was traded just prior to the start of the regular season, Alvis Whitted replaced Gabriel as the number two receiver, and Ronald Curry, despite a full recovery and flashes of brilliance on the field, has been unable to supplant Whitted for reasons that remain mysterious and frustrating to most of the Raider Nation. Gabriel’s sudden release by the Patriots yesterday generated an outpouring of discussion and rumor. Never have I seen the release of a player on another team in December generate so much intrigue in the Raider Nation. In this context, the signing of Gabriel today by the Raiders seemed inevitable. Personally, I’m happy to have Doug Gabriel back. There’s one hitch to this heartwarming story: it probably won’t make a bit of difference. Think about it. Ronald Curry, who is superior to Doug Gabriel, is still fighting for playing time. By that logic, Gabriel is our new number four or five receiver. Not exactly an earth-shattering development. Then again, when your depth chart has become so dyslexic that Alvis Whitted starts ahead of Ronald Curry and Jerry Porter, you never know what might happen. In any case, welcome back to Oakland, Doug Gabriel. I hope you still recognize the place. A lot has gone down since you left. I don’t have one postgame take, let alone my normal five postgame takes. I have no postgame take. If I write that everything will be okay, then people will scream that I’ve got my head in the sand (or worse). If I write that this game was an insult to the concept of competitive football, then people will scream that I’m turning into a pessimist. Let me just say that, while I remain an optimist about the Raiders, I’m increasingly left grasping for evidence to support my optimism. This should be a lively and insightful discussion, as I know there are bright minds on both sides of this Raider Take fence right now. Maybe you can change some minds…Or maybe your mind will be changed. Let the debate commence. Ummm...Don't we want to go for two points after the touchdown, to try to make it 27-11, putting us within two scores (two touchdowns and two two-point conversions) instead of three scores (two touchowns plus one field goal)? Undone by our own mistakes. What will it take to get Anderson and Williams off the field, and Madsen on the field? How many mistakes do we allow these two tight ends? What is going on? Am I missing something? Didn't Madsen provide most of our receiving offense two weeks against San Diego? Thoughts? Let's use this take as a thread to discuss the game in progress as well. Well, we now know the first unit coach who should be given the boot, if the following incident is true to the degree it's being reported. According to the San Francisco Chronicle: "Raiders special teams coach Ted Daisher erupted in a sideline outburst Sunday that he later apologized for, but some of his players aren't in a forgiving mood....According to three special teams players, Daisher shoved a team intern, screamed at his assistant, yelled at players who looked at him and challenged players to fistfights during a 23-14 loss to the Houston Texans..."He was out of control," one of the players said, speaking on the condition of anonymity for fear of reprisal. One week ago, Raiders coach Art Shell warned the team to keep their problems in-house..."He was pushing people, yelling at people, just for staring at him. I was completely shocked. It was embarrassing. I haven't seen anything like that since junior high school." On the one hand, we have Coach Shell, impassive to the bitter end, even when the refs are screwing us by calling a celebratory spike a forward pass. On the other hand, we have our special teams coach allegedly (thanks BlandaRocked, for reminding us that that this is alleged) going berserk and shoving interns because his unit can't stop kick returns. On the one hand, we have Coach Shell throwing media bombs at Mike Lombardi one week ago. On the other hand, we have him warning the team a week ago to keep their problems in-house. On the one hand, Coach Shell is preaching accountability. On the other hand, underperformers stay in the game while guys like Madsen and Morant sit idle on the sidelines, and Tom Walsh is defended to the bitter end. In my earlier take, I said that I think our problem is more spiritual than physical. What's happening on offense and special teams has little to do with ability, in my opinion. I'm not saying we have world-class talent. But even mediocre talent can't explain what's happening. The impotence of the offense is reaching biblical proportions. Just look at Calico Jack's breakdown of our second-half scoring stats. The spiritual component of our problem may very well lie in the types of inconsistencies, and potential double standards, cited above. Nothing will kill an organization faster than a sense that the leadership is saying, "Do as I say, not as I do." Art Shell has made an admirable effort to set the tone for this team. Back in training camp, he said that you can't have the inmates running the asylum, which has indeed been a problem for the Raiders. I would say that he's halfway there. Just look at the defense. The question now is, will he continue to roll this big rock up the hill, and over the crest toward glory? Or will the rock roll back down before he's reached the top, taking him out on its way down? The answer likely lies in Coach Shell's efficiency in eliminating the contradictions and inconsistencies that still plague our leadership and locker room, and eliminating the persons and personalities who refuse to play by Shell's new rules, no matter what dollar figure is attached to their contract. 1. The playcalling on the first offensive drive was certainly refreshing. John Shoop was clearly making a statement, calling slants and other fast-developing plays to declare the return of sanity to the coordinator position. The Texans were on their heels. Then ReShard Lee takes off on yet another good call, a draw, and turns upfield for a big chunk of yards, only to lose the ball and have it returned for a touchdown. The momentum was destroyed, and the turnovers became contagious, and the execution (and at times the effort) began to deteriorate. For those who say this proves that Tom Walsh’s playcalling was not the problem, I agree—it was not the problem. But it was definitely a problem. Two wrongs don’t make a right, and two problems sure don’t make a solution. I’d rather have bad players trying to execute a reasonable game plan than bad players trying to execute an irrational game plan. 2. I just love our defense. Seven points by the Texans came on the fumble return, and another seven came after a kick was returned to the three yard line. In other words, our defense wasn’t responsible for any touchdowns, and actually even scored one on their own. They held the Texans to -5 yards passing. The Texans aren’t pushovers with the pass. Even after yesterday, Andre Johnson still leads the NFL in receptions and ranks fifth in receiving yards. Our defense is remarkable, even more so considering the fact that the offense has become their mirror image. 3. Do you think it’s a coincidence that during the same week that Art Shell railed on Mike Lombardi as an alleged traitor in the national media, we did not make the decision to sign a backup kicker for an ailing Sebastian Janikowski? After all, in order to sign a kicker, and to make corresponding room on the roster, the coach and senior personnel executive would have to talk, would they not? Did their frosty relationship, and any related avoidance issues, get in the way of making a smart decision? I think it’s fair to ask that question. Am I wrong? 4. Aaron Brooks was really pissed off about something late in the second quarter. He gestured repeatedly toward the sideline after plays, raising his arms in apparent bewilderment or anger. What was up with that? Was he angry with the playcalling, or upset with his teammates? When the drive failed, he roamed the sideline alone. I am convinced that we have serious relationship issues on our offense. I see very little communication or togetherness on the sideline. I see a unit divided. It explains what we’re seeing on the field, which is an absence of timing and chemistry, along with inexcusable confusion and lack of execution unrelated to talent. Aaron Brooks was never great, but he threw for more than 3,500 yards for four straight years with the Saints. He didn’t suddenly turn incompetent. Randy Moss is supremely talented. Our offensive line was never great, but the same guys are playing much worse than last year. This has little to do with ability, in my opinion. It’s more spiritual than physical. 5. The bottom line is that something is weird and seriously wrong with our offense. Whatever it is, it needs to be exorcised. The worms need to be removed from the apple, whoever or whatever they are. Easier said than done, perhaps, especially since I’m not sure how deep this mystery problem runs. The good news is that, once this problem is fixed, I think that we might see a swift turnaround. Bonus take: Can anyone explain to me the wisdom of running a full two-minute drive beginning with 2:11 on the clock while two scores down at the end of the game? What, we're going to recover an onside kick with 10 seconds left with no timeouts and an ailing kicker and win the game with a 70-yard field goal? When we're on the 28-yard line with 58 seconds left in that situation, shouldn't we be throwing little Hail Marys to Moss in the endzone, at least giving ourselves a chance to pull off a miracle? Better playcalling, same awful execution. Where are Madsen and Morant? Why didn't we sign another kicker for this game? Lights-out defense gets no support from special teams or the offense. Again. The illness appears to be systemic. The gulls circle. The Coliseum goes dark. Now, more than ever, is the time to defend our Nation—against the naysayers, trashtalkers, mediots and other Raiders Haters who are so gleeful over our losing record. Now is the time to stand tall against those who question the concept of unquestioned loyalty, because they’ve never dared to step off the bandwagon when it comes to rooting for teams. 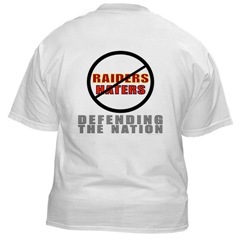 In other words, now is the time to strut proudly around town in Raider Take’s Defending The Nation two-sided t-shirt. This masterpiece features the words “Raider Haters” rendered in AFC West rival colors and encircled by a black strikethrough. Just below is our motto “Defending The Nation” in silver with black trim. The front of the shirt features the Raider Take logo across the chest. This shirt looks cooler in person than it does in the photo. Treat yourself and your Raiders allies for the holidays. Click here to purchase.